Ready in less than 30 minutes, this Sundried Tomato Pesto Pasta makes a great weeknight meal that everyone will love! 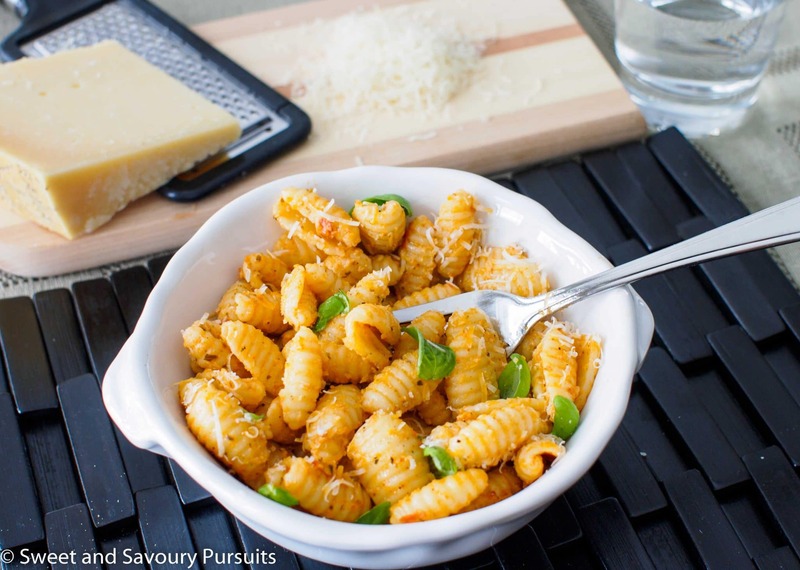 This Sundried Tomato Pesto Pasta is a delicious simple dish with only a few ingredients and is perfect when you need something in a hurry. It makes a great weeknight dinner that can be ready in less than 30 minutes. If you have picky eaters in your household then you know how important it is to have good recipes that are easily adaptable, this recipe is perfect for that. There is so much flexibility with this Sundried Tomato Pesto Pasta. You can toss in some cooked chicken, ground beef or shrimp for added protein. You can also add some cooked veggies such as peas, onions or mushrooms. Some black olives would also be delicious with this pasta. And if you prefer a creamier pasta you can add more mascarpone cheese. Mascarpone cheese is a rich, thick and creamy cow’s milk cheese that has a mild flavour and can be used in sweet or savoury dishes. Adding it to this dish with a bit of the reserved cooking liquid from the pasta and the sundried tomato pesto makes this pasta nice and creamy. Sundried tomato pesto is packed with concentrated flavour which means that this dish can taste great with very little effort. And on certain days that can be a very good thing! Best of all, this is a kid-friendly recipe that will make everyone happy! Over high heat, bring a large pot of salted water to a boil. When the pasta is al dente, remove 1/4 cup of the pasta cooking liquid before draining the pasta. Return the drained pasta to the pot and add the mascarpone, pesto and Parmigiano and stir over low heat. Slowly add just enough of the reserved water to the pasta until you have achieved the desired creaminess. Season to taste with salt and freshly ground pepper. Add fresh basil leaves and serve with more Parmigiano. This looks so good! I love your blog! So beautiful! Thank you Kloé for the wonderful compliments. They are very appreciated. Just took a look at your blog and you have some great cookie recipes on there. My girls would love the kit kat cookies for sure! Your welcome! Your blog is so beautiful! Thanks! My family adored the kit-kat cookies. They are surprisingly addicting, so watch out! Thanks again. I’m sure they must be, will have to make a batch and give some away to friends and family! This sounds like a wonderful dish–I love the flavor of sundried tomato pesto! Thank you Nancy! To be honest I usually use basil pesto but then noticed the sundried tomato pesto and decided to give it a try for a change. I’m glad I did! This sounds delicious! Looking forward to trying mascarpone in pasta! And I love that it takes so little time. Thanks for posting! Thanks Ghina. 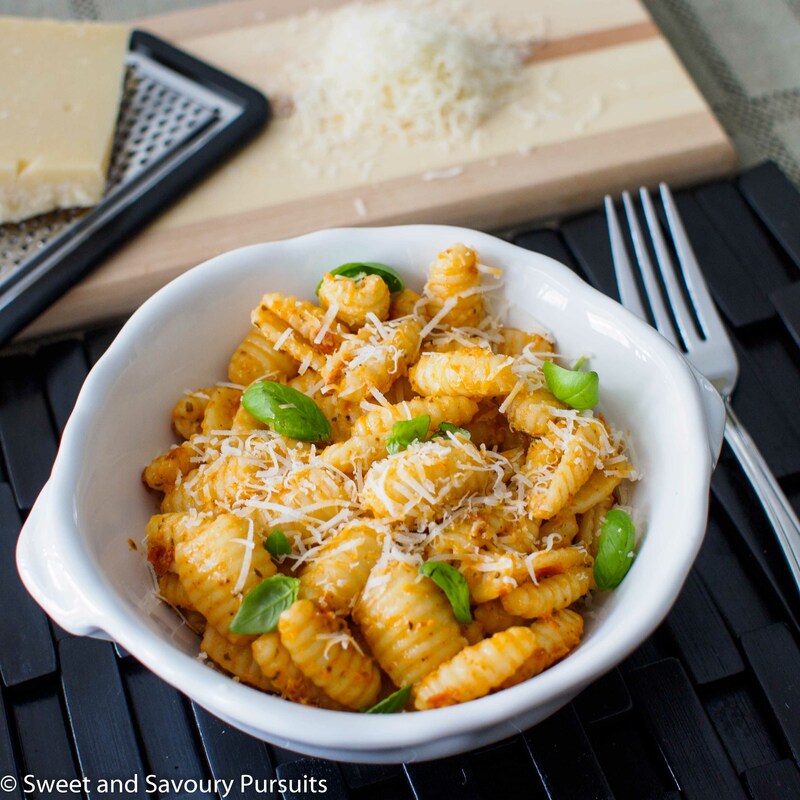 The mascarpone makes the pasta really nice and creamy, but it is not a salty cheese, so make sure you add the parmigiano for extra flavour! What type of pasta is that? Also, do you have a recommended brand for the sun-dried tomato pesto? I used an artisanal pasta named Gnocchi Sardi, probably named that way because its shape resembles gnocchi. I found it in an Italian gourmet food shop. I don’t have a recommended brand of pesto, the one I used for this recipe is called Paese mio, True Taste of Italy. This looks really good and easy to make. Thanks for sharing! Glad you think so, thank you Jennifer!